Q: How do I play music? A: You can play music on mobile device as well as Gear Fit2 Pro. 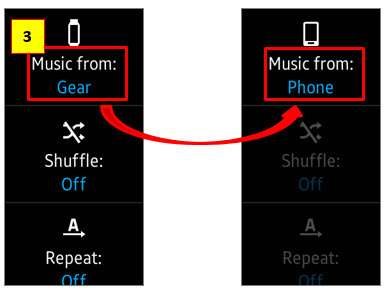 When you select a mobile device to play music from, you can control playback of the music with your Gear. The music will be played from your mobile device. 1 Tap Music Player on the Apps screen. 3 Tap “Music from: Gear”. Playback device is changed to Phone. 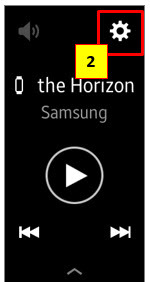 4 Tap Play icon to play the music. The music will be played on your mobile device.